Happy new year! We want to give you advance notice of all 2017 Sunday Assembly dates, so that you can add to your calendars. All events will be held at 2:30pm at Majura Hall in Dickson. Once our speakers and themes are confirmed, we will post the information to our mailing list and on our events page. Videos of recent Sunday Assembly talks: now online! In case you missed our recent Sunday Assembly events on Resilience and Connection, here are video footage of our speakers. Nicholas Stuart's keynote talk on brain injury (above). Megan Gilmour's keynote talk on Missing School (above). Stuart McMillen's personal reflection on not owning a smartphone (above). As time goes by, we will add more video footage to our Sunday Assembly Canberra YouTube channel. What is it that allows us to cope in the face of challenges or adversity? Is it possible to thrive under such pressure? 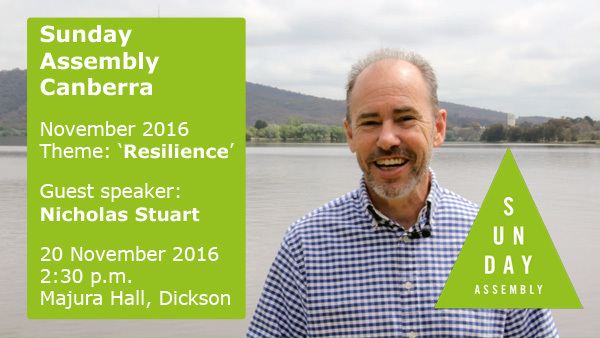 At Sunday Assembly Canberra in November 2016, we will focus on the theme of Resilience. We have recruited a wonderful speaker to teach us about this important topic. Volunteer! Richie's 2 minute pitch video. Sunday Assembly Canberra host Richie Merzian gives you the intro to the volunteering opportunities available within the Organising Committee. In September we will talk about a subject that is uncomfortable and confronting. But it doesn't have to be. We will be opening the (crypt) door to the theme of Death, and hearing from a man all to familiar with the subject, (Dr) Philip Nitschke, who helped bring in the first voluntary euthanasia laws in the world. Almost every kid in the 90's watched The Simpsons and is familiar with the song-and-dance salesman who duped Springfield into buying a Monorail. We are looking for a new coordinator for the Dig-It Gardening Group. The choir rehearses on Monday evenings. Please get in touch with Meredith if you are interested in joining the choir or band. Christina is arranging a special screening at the Aboriginal Tent Embassy for the first week in March. Keep an eye out on Facebook for more details - you don't want to miss this one! Signing up lets you receive our newsletter, follow our groups and volunteer if you want!